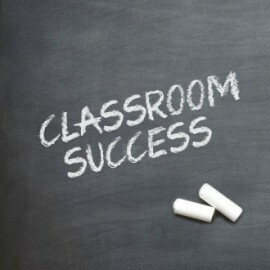 A great K-12 classroom guitar program doesn’t happen by accident. performance based learning, and a desire for dramatic growth in music participation. The common assumption that guitar is so easy that any music teacher can teach classroom guitar without training is just wrong. In music education degree programs instrumental methods classed typically don’t include guitar. The result is that few classroom educators have an adequate understanding of guitar pedagogy, classroom guitar curriculum design, or possess the playing skills to confidently and effectively teach a guitar class. Providing this know-how through professional development for teaching classroom guitar should be a critical part of your plan. 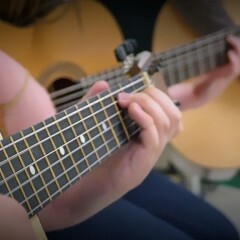 What and how classroom guitar students are taught is 80% of a successful program. Teachers need to start with a correct classroom guitar curriculum that meets State and core music standards. Ensemble performance and a diverse repertoire is important. 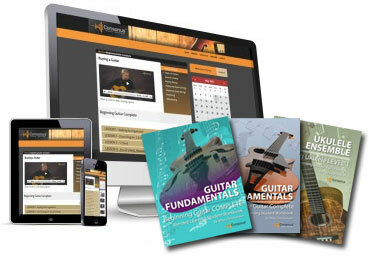 Most available guitar method books are intended for self-learners or private students, and are written by guitarists who haven’t taught in a classroom setting. Concepts such as sequencing, pacing, assessment, and guitar ensemble performance are ignored.Now for the “how”. Academics is going through a revolution as technology is being adopted in every classroom. The preferred instruction method is blended learning and it works perfectly for classroom guitar. The added dimension of technology assisted teaching in the classroom combined with online lesson review and home practice for students radically improves learning outcomes, and it’s available today. A successful classroom guitar program can become an institution in your schools and district. Make the visibility of your classroom guitar groups a priority through student performances in their own and feeder schools, community venues, and State MEA festivals. Performance drives future enrollment, and community support from parents and the local community. Classroom Guitar Teachers need to understand these strategies and prioritize them. That’s right, plan for success. It won’t happen by itself and top down planning is essential. Questions like: Which grades participate? How will students progress through a multi-year course of study? How does curriculum integrate through grades? What standards should be adopted and how is progress assessed? What’s the optimal classroom guitar curriculum and instruction method? Your plan needs to address these issues, and many of these decisions shouldn’t be entirely site based. We at Consonus Music are the one source for the knowledge and solutions you need to start a new classroom guitar program or improve an existing one. 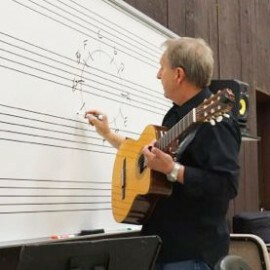 Mike Christiansen, Director of Curriculum, is an expert in professional development training for K-12 classroom guitar teachers. Mike conducts both onsite and online training workshops. Consonus also develops and publishes the best of breed blended learning courseware for classroom guitar and classroom ukulele that incorporates tried and true curriculum design, and a tested instruction model that is helping novice guitar teachers produce top quality results in classrooms around the nation.